Hope its not to bad mate, get well soon. I'd forgotten this thread from many moons ago, but I'm gonna resurrect it on the grounds that I'm once again a poor wounded soulja. As you may have spotted from a pic a couple of weeks back, I crashed my bike. I was on holiday in Spain with Anakin when I made a mistake on a steep downhill section and battered myself into the floor from a fairly long way up. My shoulder joint dislocated and I was face down on a 45 degree slope with the bike wedged between my legs. I couldn't move and was in a lot of pain, to the point where I heard myself make a sad little mooing noise (no joke, making incoherent noises is bad news, and I'm not the kind to make a fuss) Fortunately Anakin was riding behind me, she managed to remove the bike from between my twisted legs and as she did I was able to re-seat my shoulder joint. Which was agony. The pain was really bad at this point, and I started to feel a bit shocky. Those of you who have ever 'pulled a whitey' will know the feeling. As my vision started to go a bit shakey and black at the edges I, forever the Englishman, told her "I think I might pass out, I'll be OK though". Then I didn't pass out, which kinda spoiled the moment. She positioned me so that my feet were above my head on the steep slope and I immediately began to feel better. Eventually I was able to walk and even push my bike, we were about 1km from the car and made it back with no further mishaps. There was a first aid kit in the car and so I was duly strapped up, dosed up and driven 4 hours to Barcelona where we had friends. This is a pic from the bottom of the hill, I was less smiley 20 minutes prior to this. 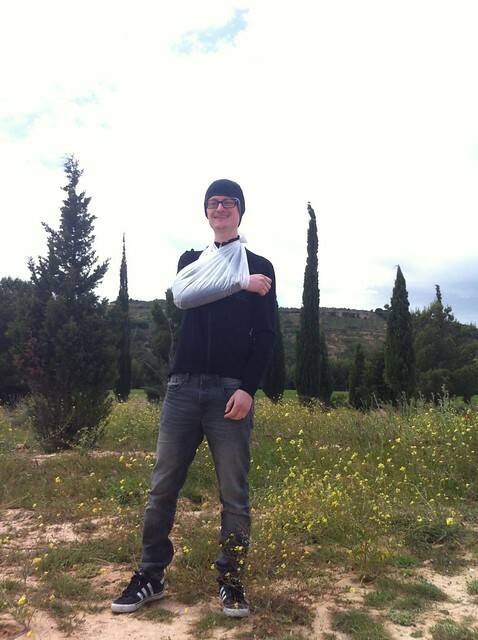 In Barcelona I ditched the 1st aid sling and got a slightly nicer looking one that was adjustable and paired it up with a rather natty ladies belt from Anakin's sister which, when tucked into and under the sling (the belt, not the sister) held my arm firmly in position. I explored the city thus attired. Then we drove home, about a billion miles across France. It's now two weeks later, I've had the all clear to ditch the sling but need to visit the fracture clinic next week so I'm not sorted yet and today is the first day that I've been able to lift my elbow above shoulder height. I would struggle to do the YMCA, but I reckon The Macarena is currently within my grasp. lol always love your write ups, chin up fella and I'm sure you be back in the saddle in no time. Doctor's visit today, I'm out of the sling though the shoulder is still tender and movement is limited. The doc told me 'you're 36, you're not 21 anymore'. Well, thanks for that, why do you think I hurl myself of stuff with what used to be termed 'Gay Abandon'. So that was nice of her. But she is arranging physio for me which goes some way to being told I'm an old duffer. That's brilliant! Hope i'm still doing stuff like that at 102!